1. What is your "secret sauce"? Fresh daily market information supports frequent small gains in well selected stocks. These compound more rapidly over time. We use only objective, public facts of fundamentals, volume and price unbiased by opinions. We offer fully auditable transparency of recommendations and results. We are entirely independent and do not handle client funds. We offer the freshness, quality and breadth of recommendations that might be provided by research departments at successful hedge funds. We are entirely data driven, use artificial intelligence techniques to exploit useful patterns, and track every result. 2. What is your value proposition for Conservative Stock Picks and ZZAlpha? Higher returns with well behaved risk using liquid, US exchange traded equities. Our business is providing effective daily recommendations to subscribers, using our objective machine learning technique. 3. Do you accept money for investments? No. 4. Can you provide me with individualized investment advice? No. 5. Do you sell the securities and ETFs you recommend? No. 6. Are you affiliated with an ETF sponsor? No. 7. Are you paid commissions by a brokerage or ETF sponsor or anyone? No. 8. Do your recommendations guarantee returns? No. 9. How do you obtain your recommendations? See explanation. 10. Why do you think this "technique" is not just a run of good luck? Scientific testing. 11. Do you recommend equities for hedge strategies? Yes. 12. Do you recommend microcap stocks? No. 13. Do you recommend derivatives, options or futures? No. 14. What is "machine learning?" See explanation. 15. What data do you use? Public objective facts. 16. What kind of testing have you conducted? See explanation. 17. Has anyone else tested the machine learning technique? See explanation. 18. Do your employees trade in the equities and ETFs listed in portfolio recommendations? Yes. 19. How do your recommendations incorporate the "news" or "sentiment" ? They do not. 20. Do you modify the results after the objective ZZAlpha® machine learning engine produces recommendations? No. 21. Does a reliable third-party notarize your recommendations to prove they are created before the market opens? Yes. 22. Do the trading evaluation model results you show assume using leverage? No. 23. Do the trading evaluation model results you show reflect trading costs? No in the newsletters, yes on the web site. 24. In your trading evaluation results for short portfolios, do you assume that short shares will be available for shorting? Yes. 25. What additional investment risks are introduced by or aggravated by a machine learning technique? See explanation. 26. What is the difference in "annualized return" in the ZZAlpha statistics and the "average annual return" that some commentators use? See explanation. 27. Do your results have "survivor bias?" No. 28. What do subscriptions cost? See explanation. 29. Do you expect subscription rates to rise? See explanation. 30. Do you invest your own funds using these recommendations? Yes. 31. Do you sell the names or contact information of subscribers or persons inquiring? No. 32. Where did the name ZZAlpha come from? The notion that after you listen to all the opinions from A to ZZ, the true alpha can best be obtained from hard market facts. Higher returns with constrained risk using liquid, US exchange traded equities. We sell subscriptions to daily recommendations that our advanced machine learning technique produces. 3. Do you accept money for investments? No. ZZAlpha LTD. is not a hedge fund, mutual fund, trading company, wealth manager or stock broker. We serve newsletter recommendations to those entities and other professional and knowledgeable investors. 4. Can you provide me with investment advice? No. ZZAlpha LTD. does not provide individualized investment advice. We provide standard recommendation portfolios of stocks and ETFs falling in objectively defined market segments (for example, stocks with capitalization of $5B or more). Some institutional investors and traders have internal or external constraints on the nature of their investments. We can work with those institutional investors to provide recommendations that would comply with those constraints (such as liquidity, capitalization, etc.). 5. Do you sell the securities and ETFs you recommend? No. ZZAlpha LTD. does not buy or sell securities or ETFs. 6. Are you affiliated with an ETF sponsor? No. We use solely objective facts and are entirely independent. 7. Are you paid commissions by a brokerage or ETF sponsor or anyone? No. We are entirely independent. We independently select and recommend stocks and ETFs that are well established, liquid, and reflect the indices or segments of interest. We recommend equities that are actively traded on US Exchanges. 8. Do your recommendations guarantee returns? No. If a subscriber finds the recommendations unsatisfactory for any reason, the subscriber may cancel the subscription in accord with the subscription agreement. Please remember: PAST PERFORMANCE does NOT indicate the probability of similar performance in future market conditions. Investment in equities involves SUBSTANTIAL RISK and has the potential for partial or complete LOSS of funds invested. 9. How do you obtain your recommendations? The daily recommendation emailed to you comes solely from our tested, ZZAlpha® objective machine learning technique. It processes over half a billion pieces of public data every night on high performance data-center computers in order to make each day's recommendations. Not every forecast is right, but over time they do well. By-the-way, making consistently better recommendations across over 40 US market segments every day is rocket science. Borrowing from the US Air Force slogan, "It's not science fiction. It's what we do every day." 10. Why do you think this "technique" is not just a run of good luck? See below on this page about scientific testing. We compared the ZZAlpha® machine learning recommendations against "throwing darts." The graph below shows the returns generated from the machine learning technique against the results expected of the segment using 1000 trials throwing darts. This example is from the S&P500 recommendations. This example graph helps understand the often overlooked fallacy of indices as "standard benchmarks", which indices are often used by brokerages to claim superior performance. The SP 500 Index (^GSPC) over the 3 years (not shown on graph above) had an annualized gain of 17.3%, but simply buying a tracking ETF (SPY shown in the graph) that accumulates dividends would have produced the 19.7% annualized gain. 11. Do you recommend equities for hedge strategies? Yes. We can make daily newsletter recommendations to professional investors of both long and short positions for each portfolio of equities. We do not recommend how to weight among long and short positions. 12. Do you recommend microcap stocks? No. ZZAlpha LTD. focuses on stocks with sustained trading volume over 80,000 shares a day and price over $3.00. The machine learning technique ignores tiny stocks. It does not recommend penny stocks, micro-capitalization stocks, IPOs, or stocks listed outside NYSE, Amex and NASDAQ. 13. Do you recommend derivatives, options or futures? No. We recommend only liquid, US exchange traded equities and ETFs. Of course, a professional trader may find ZZAlpha recommendations useful in considering derivatives trades. 14. What is "machine learning?" Machine learning (also called artificial intelligence) is a set of computational techniques to make faster, more accurate estimates about how best to respond to new events, given what has happened (generally) in the past. The earliest of these techniques in the 1950's were rule-based expert systems ("RBES") of the sort still used in typical stock-screen systems today. RBES have been largely discarded in the machine learning community because they have been found to be "brittle" - failing to handle unexpected situations well. Today's better techniques range widely among: automata systems, Bayesian beliefs, boosting, control and operations theory, clustering methods, constraint relaxation, consensus, convex optimization, distance based associations, decision trees, deep learning, ensembles, fuzzy logic, genetic algorithms, grammars, graph algorithms, neural nets, nearest neighbor, optimal search, object-pattern matching, forward-backward planning, robotic response-intention, support vector machines, structured meta-knowledge, vector quantization, and traditional methods derived from principal/independent components, signal processing filters, and statistics of multi-variate random variables. Machine learning is foundational for Google, Facebook, cell-phone communications, voice recognition, commercial auto-pilots and much of the world's advanced medical research, defense and intelligence activities. 15. What data do you use? Public objective facts. We use two types of data: objective end-of-day facts for US exchange traded equities from a public free or subscription provider (such as Google, Yahoo, Reuters, Bloomberg) and objective fundamentals (for example capitalization or price-earnings ratio) from a public free or subscription provider (such as Google or Standard&Poor's). We also use IPO information from the SEC, and announcements of recent mergers and acquisitions. We do not use "news, opinion or analysis." 16. What kind of testing have you conducted? a) We compared 2005-2014 results obtained using the ZZAlpha® machine learning technique with results from large Monte Carlo simulations. In those simulations, stocks were repeatedly selected at random (“with darts”) from the same population that the ZZAlpha® machine learning technique used. The simulations were repeated for 1000 trials and used portfolio sizes ranging from 1 to 100 in size each day. 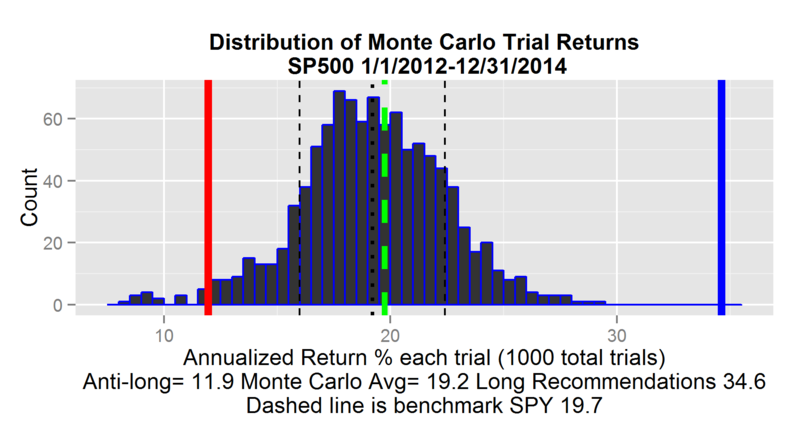 From those Monte Carlo simulations, the population standard deviations (for given portfolio sizes and market segments) were obtained so that the significance (sigma or Z-score) of the ZZAlpha® machine learning technique results could be evaluated. During development of the ZZAlpha® machine learning technique, the technique was tuned based exclusively on portions of 2008 data. All other results are out-of-sample, step-forward testing. The 2005-2014 results of the ZZAlpha® machine learning recommendations in many cases exceed 3 sigma (3 standard deviations above the expected average), which implies that the chance that random “luck” explains the profitable results is less than 1 in a thousand. b) We have assembled results across over 40 different market segments, and across 4 different portfolio sizes (up to 20 long and 20 short). The results are robust in spite of the differences of broad market behavior in those years and the differences among the market segments tested. We suggest that the tests of ZZAlpha® machine learning recommendation results prove that Prof. Fama’s famous “Efficient Market Hypothesis” is false, and that significant, exploitable market inefficiencies exist today in many market segments. 17. Has anyone else tested the machine learning technique? ZZAlpha currently uses two techniques. The first is an "out-of-the-box" machine learning technique that has been used by hundreds of enterprises world-wide, is a standard tool of contemporary statistical analysis, and has been the subject of thousands of peer-reviewed scientific papers. However, because of the chief scientist's long and wide-ranging experience with machine learning tools and research, we apply effective data transforms and correct settings when implementing the machine learning technique. The second technique originated at ZZAlpha and is unique. 18. Do ZZAlpha LTD. employees trade in the equities or ETFs listed in portfolio recommendations? Yes, the officers and employees do use some or all of the daily recommendations for their own personal investments, but are directed not to do so outside of exchange regular hours. 19. How do ZZAlpha® recommendations incorporate the "news" or "sentiment" ? They do not. The ZZAlpha® machine learning technique uses price, volume and fundamentals data from standard data sources. We do not use news reports or opinions, whether on-line, on paper or on TV. We do not use tips, inside information, rumor, opinions, interviews, blogs, tweets, the "buzz" on the street or rants of TV entertainers (no offense intended to Jim Cramer of Mad Money). We are not located in NYC. We do not interview company executives, attend company meetings, or tour company sites to acquire information. We do not obtain annual or quarterly reports, press releases or most SEC filings or anything labeled "forward looking." Objective facts drive our approach to behavioral finance. We do not talk to economists, politicians, forecasters or astrologers about the future. 20. Do you modify the results after the objective ZZAlpha® machine learning engine produces recommendations? No. The results of the learning from objective facts are not filtered by human opinions or biases. 21. Does a reliable third-party notarize your recommendations to prove they are created before the market opens? 22. Do the trading evaluation model results you show assume using leverage? No. Obviously, some institutional and professional investors may choose to use leverage, options, or derivatives to attempt to increase profits from ZZAlpha® portfolio recommendations. 23. Do the trading evaluation model results you show reflect trading costs? Yes and no. Internet discount retail brokerages such as Fidelity or TDAmeritrade currently charge $5-$10 for a trade, which is a relatively insignificant cost for professional investors. Beginning in 2017, free trades may be available from other brokerages. We assume $5. Institutional investors may have lower costs of under $0.005 per share. Use of a limit order controls slippage. We have modeled the effect of commissions and found that as assets under management grow beyond $50,000, the appropriate discount commissions decline to relative insignificance. However, the results shown on newsletters do not include trading costs. 24. In your trading evaluation results for short portfolios, do you assume that short shares will be available for shorting? Yes. Instead of attempting to calculate results from "shorts," we evaluate using an "anti-long" methodology which evaluates what occurs when short recommendations are "erroneously" treated as buys. This avoids the true market limitations on availability of short shares under different circumstances, assumption of short margin interest rates, and the lack of uniform practice on calculating percentage returns on short transactions..
25. What additional investment risks are introduced by or aggravated by a machine learning technique? a) Bad data - Occasionally, public data suppliers, supply incorrect information about equities. Although we use techniques to validate arriving data every day, sometimes current recommendations will be based on some bad data. Our historic results usually have the benefit of any subsequent corrections by the data suppliers. b) Turn risk - The world can change overnight. The ZZAlpha® machine learning technique typically "believes" that tomorrow will be a lot like today and a lot like the past. It can take a few days before the ZZAlpha® engine learns about and reacts to a new economic environment. In the interim, until the model "turns course," the ZZAlpha® recommendations may give poor results. The statistics community sometimes calls this "non-stationarity" risk. c) Sunset risk - The ZZAlpha® machine learning technique provides recommendations that assume a future specific close-out date. Environment, news and company events will affect the stock price before the sunset is reached. Once ZZAlpha® recommendations are made, they are not modified in light of information that may become available during the hold period. We do not make "sell early" recommendations. d) Diversification risks - The ZZAlpha® machine learning engine works to find improved returns (alpha) within a specified domain of stocks. There is currently no attempt to diversify recommendations within each domain. A user who needs the ability to diversify should acquire a larger portfolio of recommendations from ZZAlpha, and then winnow according to its own diversification standards and investment manager’s advice. 26. What is the difference in "annualized return" in the ZZAlpha statistics and the "average annual return" that some commentators use? This is important. Suppose you have an investment that has these returns for two years: -50%, +50%. Clearly, the "average annual return" is zero: It makes you think you came out even. But, you LOST MONEY! because what you have is .50 x 1.50 = .75 i.e. you lost 25% cumulatively over the two years. "Annualized return" gives a more accurate picture: you LOST 13% a year. "Average annual return" misleads and should be banned by the SEC for use in financial reporting of time series results. 27. Do your results have "survivor bias?" No, with a nuance. For each historical week of forward testing we use a list of stocks that were actually trading on NYSE, AMEX or NASDAQ at the start of that week, regardless of whether they still exist today and are traded on the exchanges today. Companies from years ago may have gone out of business, merged, changed their name, or trade now as penny stocks and we now know are not "survivors." When we step-forward test, we use only information that was actually available before trading on that historical day of the test. The nuance is this: As dividends and splits affect stock prices over time, the relative price on an earlier day grows gradually less. This results in rounding errors where prices are reported to the nearest cent. These rounding errors can become significant errors in the historic prices of the survivors, and can lead to mis-statement of the historic returns of survivors, when using current reports of historical prices, rather than historical records of then current prices. Our calculations of returns prior to 2012 are affected by this nuance and are less accurate. Returns calculated for recommendations since Nov 2011 are based on daily contemporary data. 28. What do subscriptions cost? Subscriptions range from $2995 USD to $195,000 annually. Contact us concerning exclusive and custom-constraint subscriptions. 29. Do you expect subscription rates to rise? That is possible. The results from using our recommendations, both in increased profits and in increased AUM that indirectly results from providing excess returns, may be immensely profitable to larger investors. We also expect exclusive subscriptions will be popular with investors desiring to lock in exclusive access to the benefits of ZZAlpha® technology. Subscriptions and renewals may be offered by auction, and the number of subscriptions may be capped. 30. Do you invest your own funds using these recommendations? Yes. For validation, for understanding quirks of real-time market trading, for testing, and for profit, the founder invests in various recommendation portfolios. His return (after commissions and trading costs) in 2012 to date were significantly more than the S&P 500. 31. Do you sell the names or contact information of subscribers or persons inquiring? No. We preserve the privacy of our subscribers and persons making inquiries, except as necessary for payment processing through third parties. 32. Where did the name ZZAlpha come from? "Behavioral finance" has generated thousands of analyst's and entertainer's opinions, some of which are sold for hundreds of thousands of dollars. But, after you listen to all the opinions from A to ZZ, at the end of the day it is the market that speaks. We show that alpha (excess return) is obtainable from hard market facts using advanced artificial intelligence pattern recognition techniques. Copyright © 2010-2019 ZZAlpha ltd.